After all of the craziness of last week, it was interesting to listen to the noise about “How horrible it is to make things by molding or casting!” or “The parts can’t be as strong as RP’d parts!”. All good fun. We would like to point out that molding/casting IS one of the fundamental manufacturing techniques–perhaps the world’s oldest manufacturing technique (also it is an AM process). It is one of the few techniques that transforms material of low value into objects of high value. It is a value added process. What material one casts depends on the molds (and what material one uses for the molds depends on what material one casts). The standard molds in the RP/AM arena tend to be produced out of Silicone RTV (room temperature vulcanization). Silicone RTV’s are generally two part compounds that are mixed to set permanently (which makes them a thermoset plastic). Silicone RTV’s costs range from over $200/liter to as low as $20/liter. Traditional Silicone RTV’s are thick like frosting/peanut butter and can be difficult to mix BUT over the last few years several companies have released much thinner and easier to mix products (1:1 by volume). Silicone RTV molds are generally good for casting plastics–polyester, vinyl esters, epoxies, and polyurethanes, etc. One of the areas which we have been exploring centers on expanding the casting systems available for AM processes by employing ceramics, glasses, and cements for direct 3D printing. Our current favorite material is VOHP or Hydroperm. Hydroperm is a material designed for creating molds used for casting various materials–glasses through metals. A big surprise to us was that it was 3D printable (first discovered by Laura West). 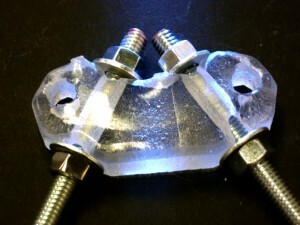 We have multiple posts regarding glass casting using VOHP. One of our graduate students Charlie Wyman has been glass casting almost non-stop since mid-November. His work and dedication are amazing (he promises more pictures and posts in the future). Two days after the conversation, we are pleased to show our first attempt–not perfect but a work in progress. We need to make some adjustment to the molds, but it seems like a glass Mendel Clonedel is possible. 3D printed molds allow material possibilities that go beyond Silicone RTV. Unfold Design Studios recent work on extruding ceramics using a RapMan system provides another pathway to molds for glass and metals. 14 Comments on Glass Vertex Anyone? Sounds like a great idea. 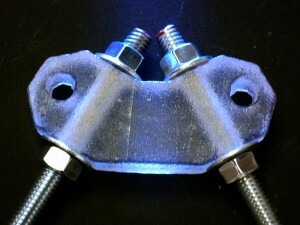 In fact, we have been quite successful in casting both Aluminum and Bronze into the direct print 3DP molds. If you have access to a 3D powder printer, then go get some Hydroperm and start printing. If not, perhaps, you’d like to suggest a geometry for us to try by emailing an STL file. Lastly, we’ve wondered if we should do a SteamPunk version of a Mendel (Bronze printed parts with Bronze rods, nuts, bolts, etc). Hopefully next week I will publish the stl’s and original cad files so people can further improve it. Ioan, your results look VERY promising. Keep up the great work. So if your students wants to experiment with it adapting for your prusa reprap please encourage them. More brains better results.